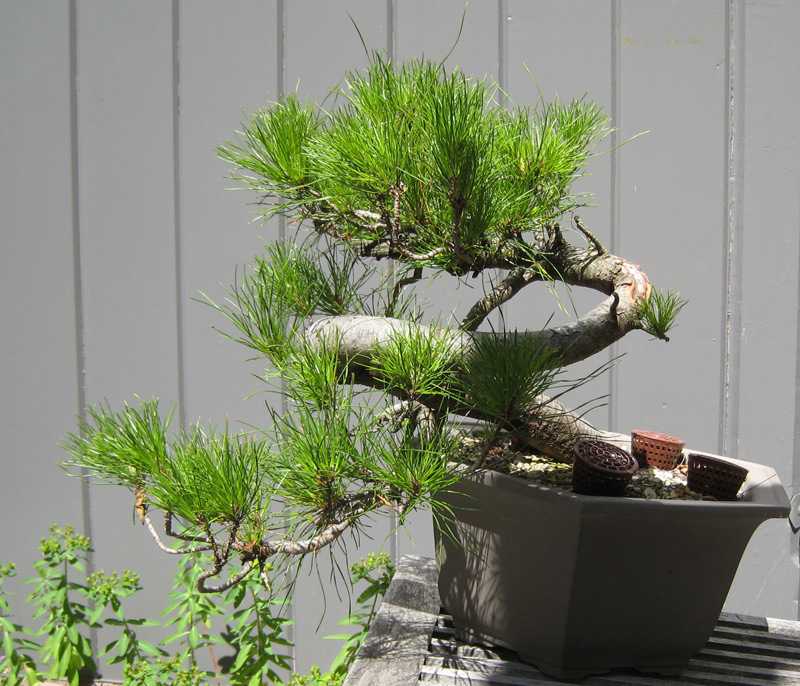 The following bonsai is one of the first trees I collected a number of years ago. 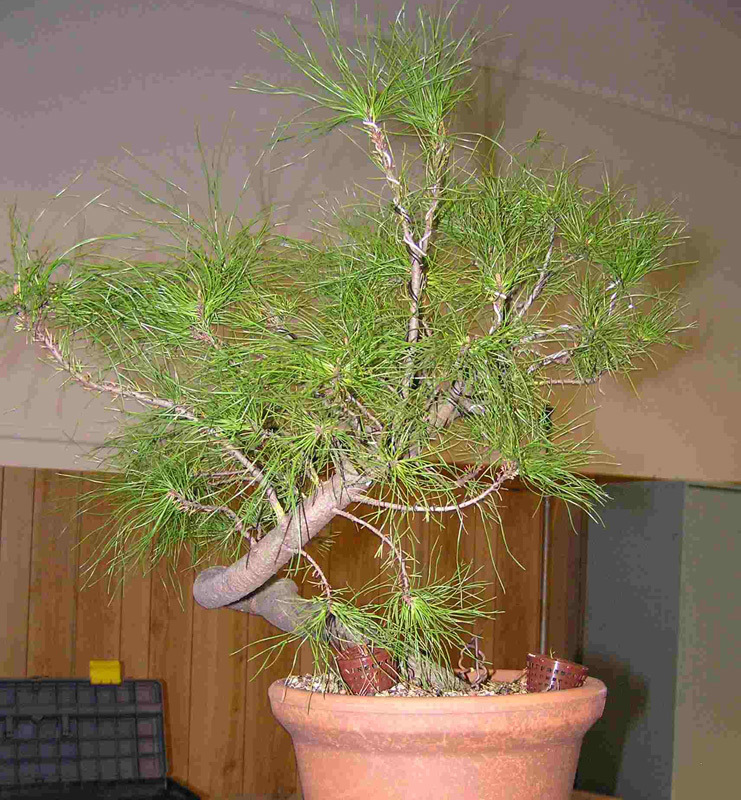 It is a radiata or Monterey pine (Pinus radiata). I quite like the species to work with but i am still trying to really get a grip on how to best grow and refine them. Perhaps i should make a future post on this subject. 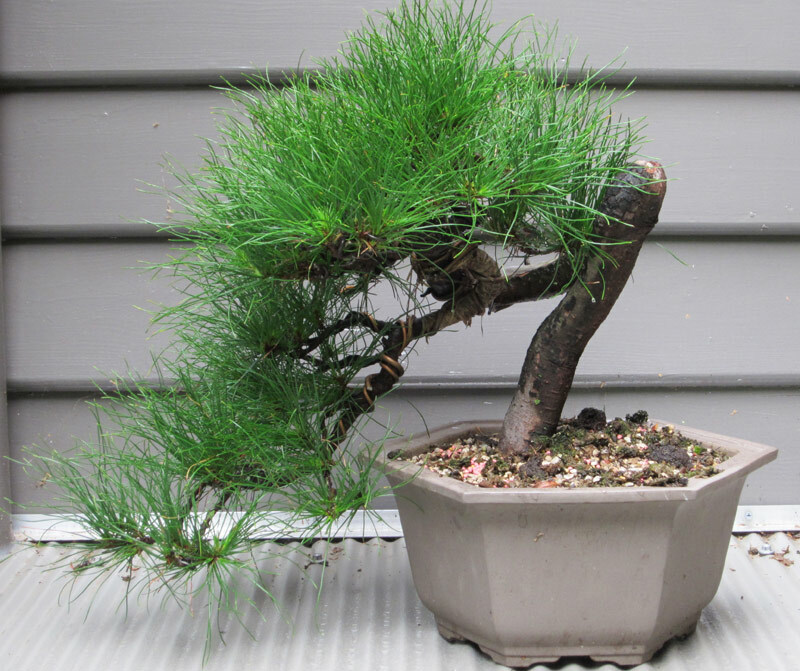 Before it began its life as a bonsai it was located on the edge of a pine plantation where it had grown on a road batter. It had a very interesting curve in the trunk which was either from machinery running it over at some stage of its life or from it trying to seek the light through the long, tangled grass in which it was growing. After collecting it took a couple of seasons for it to recover and become strong enough to be styled. 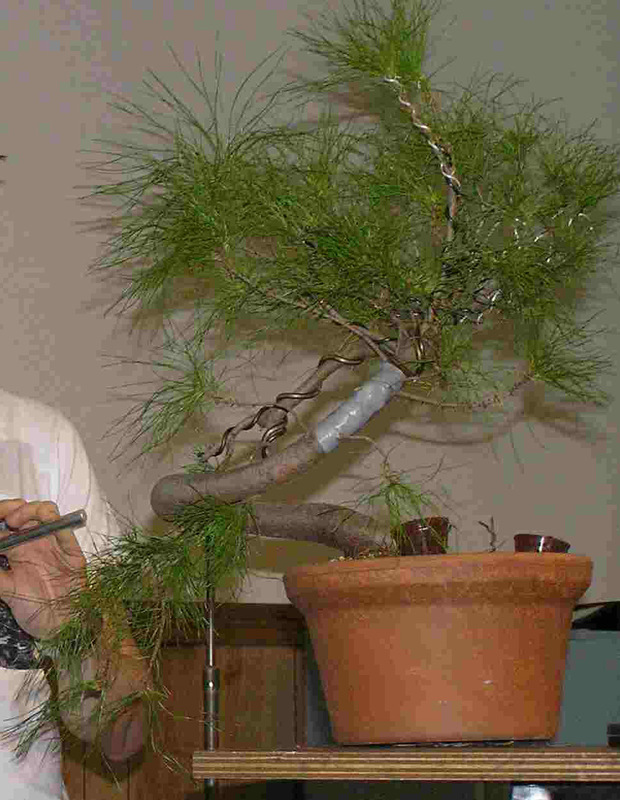 The tree before is life as a bonsai. It was needle plucked and readied for its first styling. I styled is initially at a club night as part of a demonstration. At this time i wrapped the trunk in electrical tape as a substitute for raffia and put a second large bend in the trunk. 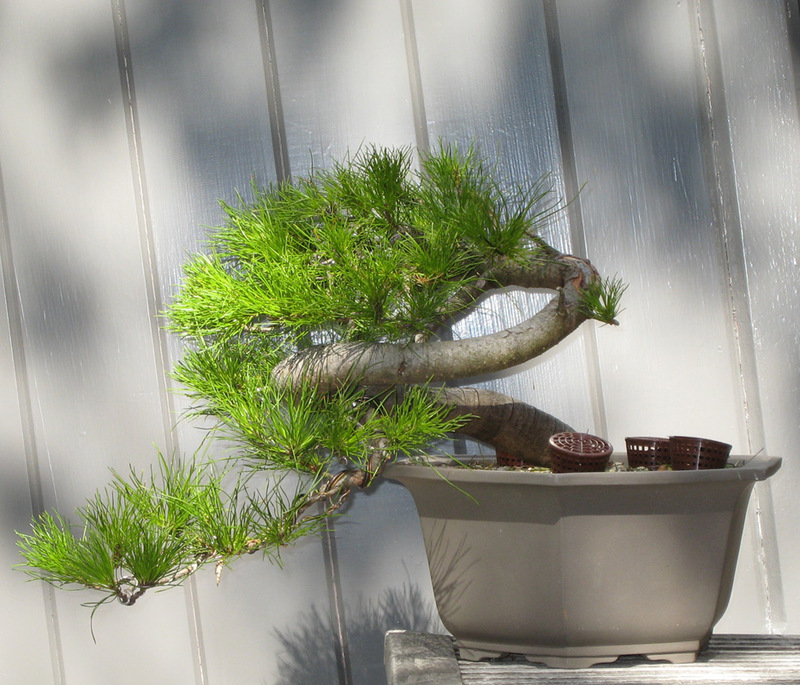 The bend seemed quite severe to those watching at the time but the little pine bent easily. I then wired it fully and placed the foliage. The first branch bent into position before the major bend was made. A top view taken some time after the first styling. The dotted line shows the trunk line. The second bend is the one made during the first styling. 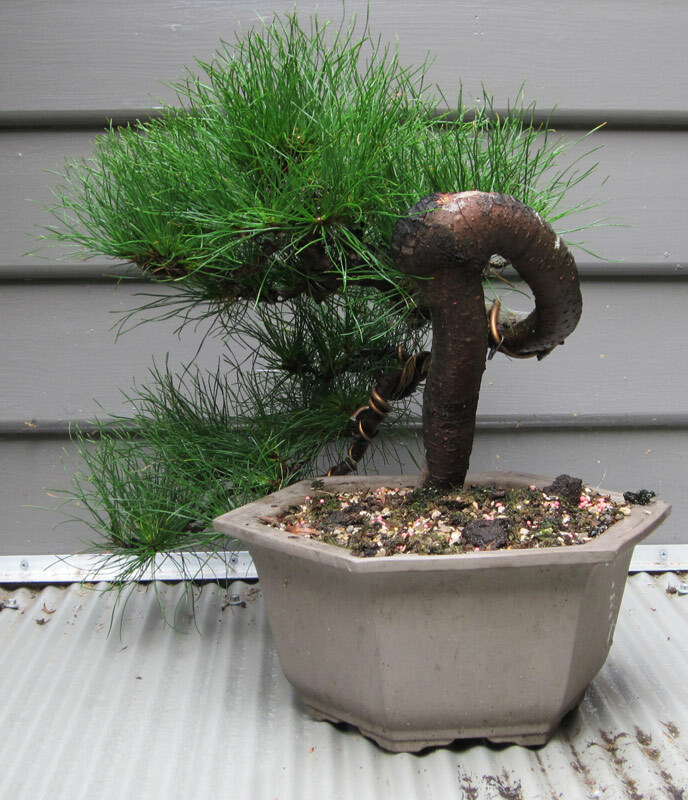 The tree recovered well and I lived with its style for some years while working on ramifying the branches. I didn’t mind the style but, I always thought there was something not quite right about it. 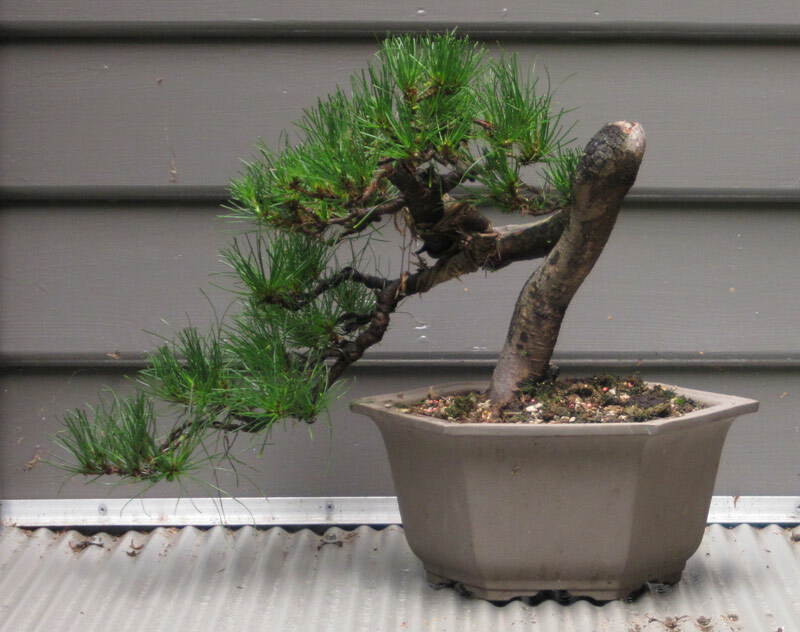 The bonsai was growing well after its first styling. It was un-wired and soon needed work. The back side. I had often looked at it from this side and thought about a possible front. The front after a re-wire. It was around this time that the shari seen in the next images started to develop. Even after a re-wire the style still was not sitting well with me so, i decided to take it to a critique session by a visiting Japanese Professional, Hirotoshi saito. He suggested that we do re-style and stand the tree up roughly 90 degrees. So, a few days later the tree was styled. It was quite a dramatic change but definitely one for the better. The results after the second re-style. That was back in July. 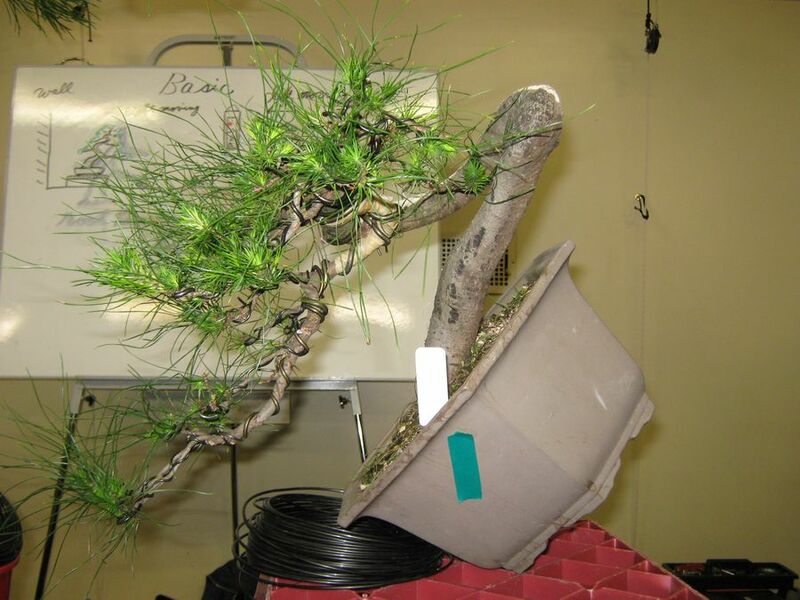 The tree was very healthy and had grown strongly, as a result there were multiple places where wire was cutting in. 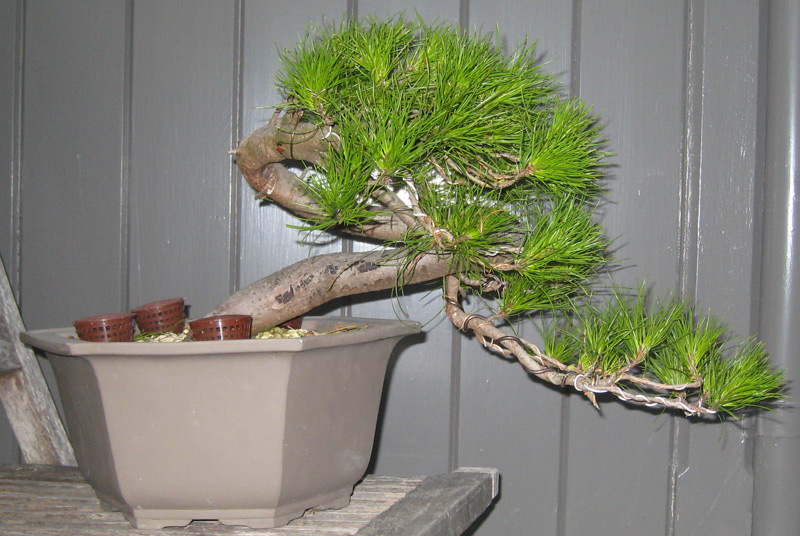 The pine after its spring growth. The back. From this view you can get an idea of the extent of the shari that naturally developed. Hopefully i can extend this over time to the front of the lower trunk. It was time for some work. 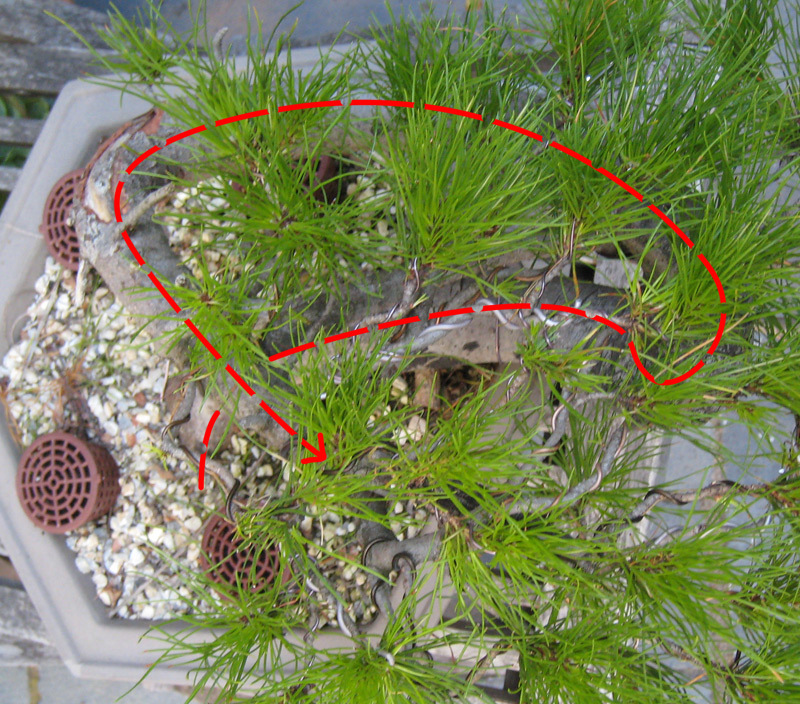 I plucked and cut needles to allow more light and air into the interior of the tree and also removed most of the wire. I was happy to see that most of the branches had set in position. The tree after the work. The tree is far from finished and i will need to re-wire it again this winter. 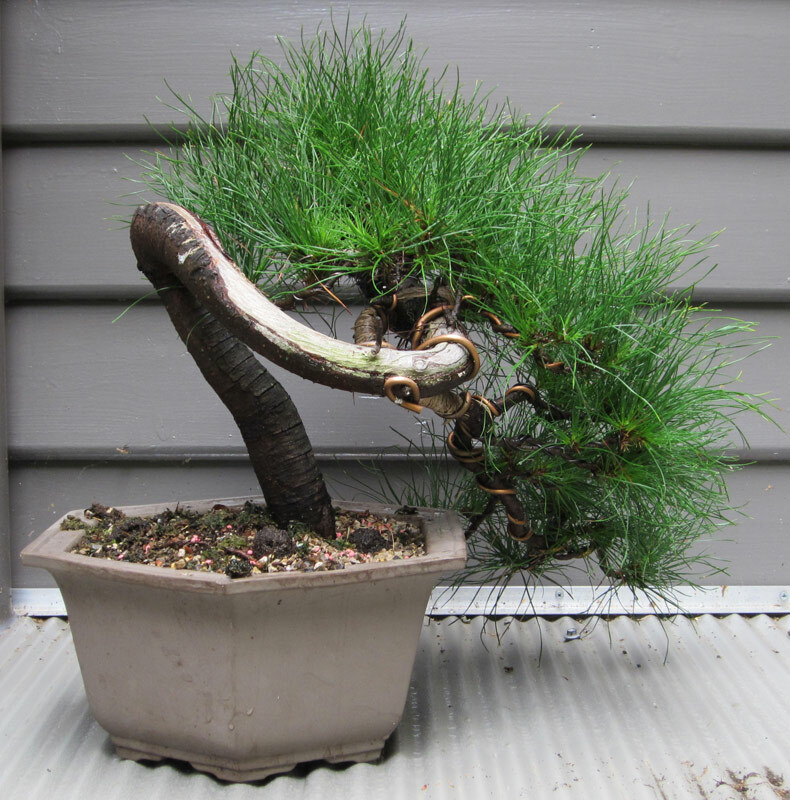 Pines with movement such as this are common in collected pines in europe but you rarely see them in Australia. Hopefully if everything goes to plan it will have a bright future in its new upright style.